Hardwood Floor Shield - Self-adhering protective film for hard surfaces, such as, tile, vinyl, VCT, laminates, marble, granite and factory finished hardwood. Multi-purpose product can be used to prevent damage to tubs and counter tops. Ideal for use during construction, remodeling, painting, etc. May be applied for up to 45 days. Dust Pro Shield - New, state-of-the-art system that makes constructing temporary walls to control dust and heat loss, quick, simple and affordable! 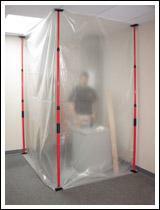 It locks the screening material firmly against the floor and ceiling. Dent resistant poles, made of heavy gauge aluminum, can extend up to 12 feet. Pole is compacted to 57 inches for easy storage. Two poles per kit. Pro Shield -Provides the ULTIMATE PROTECTION for all of your flooring needs and is reusable.